Summer Nites "50's Theme B&B"
North Wildwood bed and breakfast travel guide for romantic, historic and adventure b&b's. 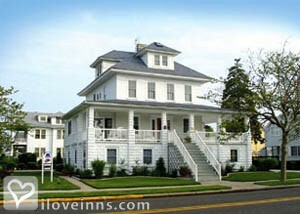 Browse through the iLoveInns.com database of North Wildwood, New Jersey bed and breakfasts and country inns to find detailed listings that include room rates, special deals and area activities. You can click on the 'check rates and availability' button to contact the innkeeper. North Wildwood is home to some of the only free beaches at the Jersey shore. In addition to the beach, it has many great attractions, including the Hereford Inlet Lighthouse, boat tours, five local vineyards, a brewery, golf, and a great boardwalk and piers with games, rides, shopping, and wonderful dining. Coming in May 2015 is the new King Kong ride. The Wildwoods are known for their 1950's Do Wop Architecture. Everyone loves the beach in the summer, but the fall, winter, and spring months boast beautiful walks on the beach and boardwalk and many attractions and fine dining still available. By Candlelight Inn. North Wildwood is home to some of the only free beaches at the Jersey shore. In addition to the beach, it is home to many great attractions, including a lighthouse, boat tours, vineyards, golf, and a great boardwalk and piers with games, rides, shopping, and dining. By Candlelight Inn. North Wildwood bears the distinction of having one of the best beaches on the Jersey Shore. Due to its beautiful beach, North Wildwood bed and breakfast inns provide guests with proximity to the Atlantic. The North Wildwood Beach is definitely a must-visit. Bring a camera and take your best shots at Hereford Inlet Lighthouse with a scenic ocean background. From the late afternoons until late evenings the North Wildwood Boardwalk is an exciting scene where locals and visitors meet to have fun at its many restaurants, gaming centers, and nightspots. Among the best restaurants in the city are Claude's Restaurant and Smack Daddy's. Pizza-lovers, on the other hand, can go to Sam's Pizza Palace. By Summer Nites "50's Theme B&B".